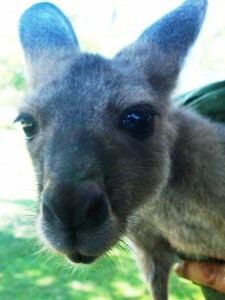 In a perfect start to Australia Day, I saw a young joey and its mum bouncing through the forest. This is the second time this week I have seen them, and both times, I have been able to keep Shorty from chasing them. She used to chase any roo she saw, but I have been able to distract her, or go the other way in the last few months when I have spotted any. I hope Mama Kanga feels safe enough to stay here, as I would love to have a resident roo. It was a different story when we planted the trees in 2009 and they pulled out the first few rows, but we bagged the trees rather than shooting the roos, which seems to be the usual treatment round here.